Need more qualified leads? 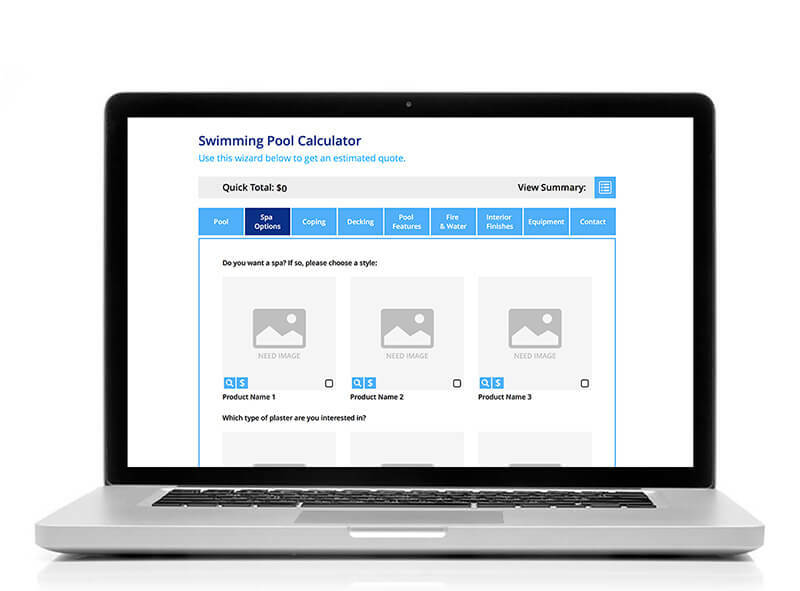 Our Swimming Pool Quote Estimator is the perfect choice for builders to offer potential customers the opportunity to choose the options they would like to see in their dream backyard. Our simple tabbed format and mobile-friendly Swimming Pool Quote Estimator widget allows users to select between different pool shapes, spa option features, decking type and more, while getting an updated pricing estimate so they can get an idea of what works within their budget. This information, along with a photo of the customer’s backyard, can be forwarded to your sales team so they know what the customer has in mind before the consultation. Easy-To-Use. Desktop and mobile-friendly widget. Make it Your Way. Customize the widget with the features you sell. Give More Quotes. Provide your customers with a quick and easy ballpark estimate. Pool construction company looking to provide their customers with a quick and easy way to contact them about a new pool construction project.